Jaipur, 12 December: As a part of the weekend theatre and cultural activities at Jawahar Kala Kendra (JKK), a play ‘Mukaam Dehru, Jila Nagaur’ will be staged twice this weekend – 16 and 17 December. Directed by Mohit Takalkar and written by Paresh Mokashi, the play is set in the year 1942. On one side revolution is in the air in a pre independent India with Gandhi announcing the Quit India movement and on the other hand the rest of world is burning in flames of World War II spearheaded by one of the greatest dictators of all times. 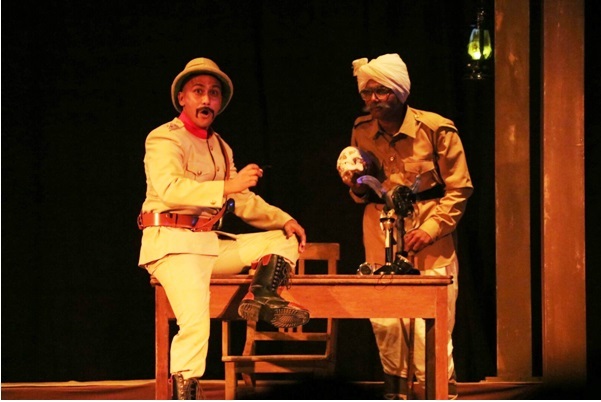 In the unique and hilarious tale of ‘Mukaam Dehru, Jila Nagaur’ one gets to witness a chance meeting of an uninvited guest, Adolf Hitler and a bewildering array of characters trying to put up a ridiculous play in a remote village of Dehru forgotten in one dusty corner of Rajasthan. The play will be presented by the Jaipur based Ujaagar Dramatic Association on 16 December and 17 December at 6.30 pm at JKK. The entry to the play is through tickets which can be obtained from JKK’s office.